Updated on (most) Tuesdays. Subscribe for free updates. 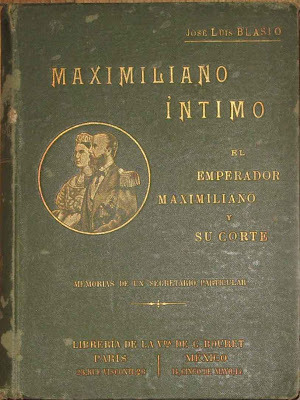 José Luis Blasio (1842 - 1923) was the author of Maximiliano íntimo, a memoir of his years as the Emperor Maximilian's private secretary (and also, an intermediate period, serving the Empress Carlota in Europe in 1866, which coincided with her spectacular psychotic breakdown). 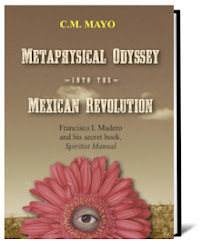 Published in Mexico City and Paris in 1905 and in English nearly three decades later as Maximilian, Emperor of Mexico (Yale University Press, 1934), Blasio's lushly vivid memoir is, without a doubt-- and never mind its less-than-correct political stance-- one of the literary treasures of Mexico. 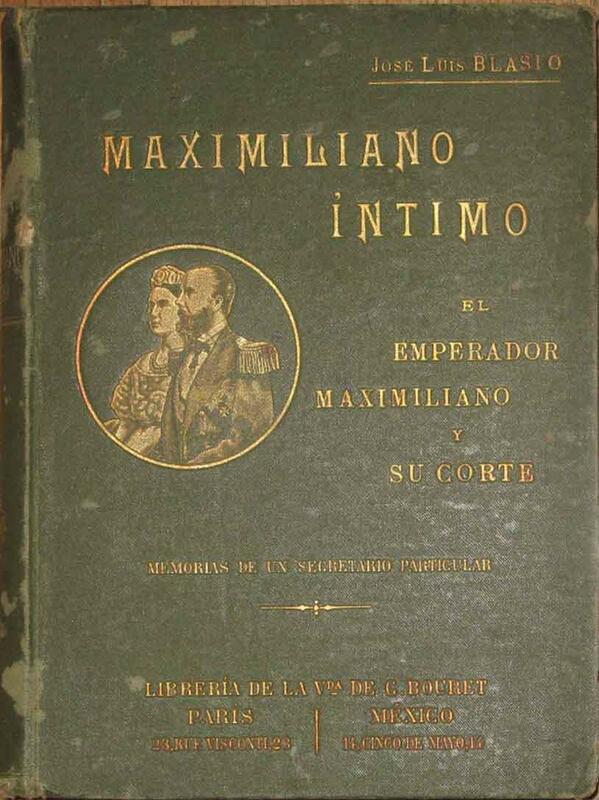 As Bernal Díaz's True History is to the Conquest, so Blasio's Maximiliano íntimo is to Mexico's Second Empire. Yes, it's that good. In Mexico's Second Empire (1864 - 1867), as in all periods of history, many people witnessed events of importance, or found themselves close to key personalities, but never, even if they lived into the ripest of lucid old age, bothered to share them in a memoir. ("Who has time?" they probably said. "Why should I care what people I don't know think?" "When I'm dead, I'm dead." & etc.) As for those who managed to put pen to paper, most cobbled together something useful for the interpid researcher but, alas, boring, and / or shot though with displays of personal vanity. Blasio opens his heart, but with the most gentlemanly consideration for the reader, and it is this informative spirit, this deep generosity, elegant in its simplicity, that lifts Maximiliano intimo into a realm beyond that of the other memoirs of the period. To be fair, I should note two other superb memoirs: Sara Yorke Stevenson's Maximilian in Mexico and Charles Blanchot's L'Intervention Française au Mexique. "[It] was upholstered in dark damask and its walls almost literally covered with exotic weapons that the emperor had collected and catalogued with his exquisite taste. The walls also had verses of the Koran handwritten in gold. In the center of the room a beautiful fountain played almost to the ceiling, a thin crystalline thread of water that refreshed that residence worthy of an oriental magnate. From the ceiling hung a canopy made of ostrich eggs enclosed within nets of green silk; the seats were plump pillows of red velvet, and the floor was covered with Turkish carpets of many colors. Everywhere magnificent censers let out plumes of perfumed smoke, and there within the visitor's easy reach, were to be seen long Arab pipes, the kind used by those refined smokers of the Orient." 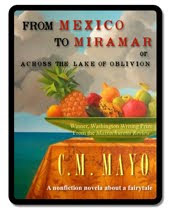 Blasio's memoir informed many scenes in my novel, The Last Prince of the Mexican Empire, among them, the chapters set in Mexico City in November 1865, Cuernavaca in January 1866, and Rome in September 1866. Blasio himself appears as a minor character in these chapters. As for Blasio's treatment of the subject of my novel, Agustin de Iturbide y Green, the toddler Maximilian made an Imperial Higness and brought into his Court: alas, Blasio makes some serious mistakes, mainly, that the child was 5 (he was only 2 1/2 years old), and that his father was dead. In fact, the child's parents, Angel and Alicia de Iturbide, were both quite alive and, after the mother changed her mind about the arrangement, wild with grief at having been separated from her child, Maximilian's response was to arrest her and have her and her husband expelled from Mexico. From Washington DC and Paris, they got up quite an intrigue against Maximilian, which is amply documented in various archives, including the Iturbide family archive in the Library of Congress (click here for a podcast about that research), the Agustin de Iturbide y Green archive at Catholic University, and in Maximilian's own archive in Vienna, which contains a file of letters from the Iturbides, including the child's father, Angel de Iturbide. My guess is that Blasio did not know much about it, as Maximilian's correspondence with the Iturbide family was direct-- without an intervening secretary-- or else through Castillo, who handled the Civil List. Blasio would have handled official correspondence, and I suppose, neither then nor later did he have the wish or the wherewithal to investigate this ugly episode. But this is a mere quibble. Until Cuevas Pérez's thesis, little was known about Blasio other than what he himself wrote about his few years in Maximilian and Carlota's service, which ended with Maximilian's execution by firing squad in Querétaro in June of 1867. "When I was a little girl, my father, Ernesto Cuevas Alvarado, always told me about a man named José Luis Blasio, who had been the godfather at his baptism and, many years before that, had served as the private secretary for Maximilian von Habsburg, for almost the entire time he was emperor. At that young age, it seemed to me a story and after a few years, it didn't make sense because I couldn't see the people of that time in relation to my father. It was not until I was in highschool that I began to wonder, and then, when I began to major in history at the National Autonomous University of Mexico, and moreso when I began my studies as an archivist at the Iberoamerican University, that I truly understood the importance of this archive, which my father had so carefully guarded. I decided to write my thesis based on these papers that no one, other than my father and Blasio himself, had read. And now I began to read.... "
"He was affable, with great political and social tact. Despite his well-known versatility, he never entered into any place, even if he found the door open, for he was very reserved, very polite and above all, noble and above rancor and vanity. He was an impeccably well dressed man. He would not go out to the street without his top hat, cane, jacket or frockcoat, or his most formal suit." "Jose Luis Blasio and Federico Gamboa were very close; they were more than family; they were very close friends... From Washington [Gamboa sent Blasio] congratulations for having finished his work about Maximilian von Habsburg and told him how sorry he was to not have been able to offer his help with as a writer, and that he was very happy that, having advised him many times to write the book, he had finally conceded." Ah, the labyrinths of literary fame. Here I couldn't help thinking of Guiseppe di Lampedusa's relationship with his cousin, close friend and and literary colleague, the poet Lucio Piccolo. In their lifetime, Piccolo was the senior on the literary scene. Guiseppe di Lampdusa, of course, was the author of one book, the beloved and now classic novel of the fall of Sicily's 19th century aristocracy, Il Gatorpardo (The Leopard). In Cuevas Pérez's thesis, which you can read on-line here, there is more detail about Blasio's subsequent career as a bookkeeper for the Ferrocarril Mexicano (Mexican Railroad), the Blasio family, his spouse Adela, friends, and other details about his years in Mexico City after the fall of the Empire and up until his death in 1923. Cuevas Pérez's also includes a complete catalog of the archive, extensive notes, and a bibliography. Originally posted at Madam Mayo blog. + How Mad Was Carlota? SCROLL ON DOWN THIS COLUMN FOR THE COMPLETE YEAR BY YEAR, MONTH BY MONTH ARCHIVE. I am C.M. Mayo, literary journalist and novelist, author of several books on Mexico, most relevantly, The Last Prince of the Mexican Empire (Unbridled Books, 2009), a novel based on the true story which was also published in Spanish as El último príncipe del Imperio Mexicano (Random House-Mondadori, 2010). 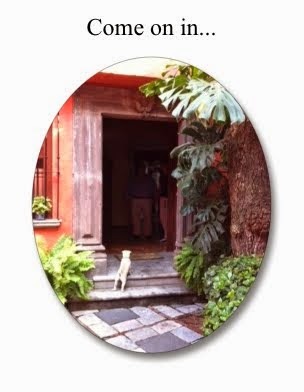 I am also the author of a long essay now available as a Kindle, From Mexico to Miramar or, Across the Lake of Oblivion (Dancing Chiva, 2011). As a result, I have at hand many books, articles, links, photos and more. Also, many people, including both amateur and professional historians, write to me about their books, articles, and other news related to this fascinating period. I would like to share this (always with permission, of course), and a blog seems like a good way to do it. Specifically, this blog covers resources, both old and new, on Mexico's Second Empire, the tumultuous period also known as the French Intervention. + Read a more detailed welcome message here. + Visit my website here. + Visit my main blog, "Madam Mayo" where I post every Monday and oftentimes more often. C.M. 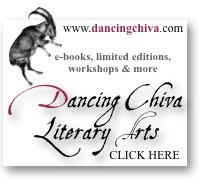 Mayo events, workshops, books, podcasts, and more. Opt in automatically. By C.M. Mayo. A novel based on the true story - named a Best Book of 2009 by Library Journal. Says the Austin American-Statesman: "A swashbuckling, riotous good time, befitting the fairy-tale promise of the opening sentence." Por C.M. Mayo, la novela basada en una historia de la vida real (Grijalbo Random House Mondadori, 2010). Traducción de Agustín Cadena. Visit my other blog, "Madam Mayo"
Watch the trailer for "The Last Prince of the Mexican Empire"
Watch the trailer for "El último príncipe del Imperio Mexicano"